Can you make risotto in the forest? Yes you can! Just follow this simple recipe and your forest risotto will be best ever! And don’t forget about juicy turkey steak that we grilled on fire in our special toaster! We bet you and your close ones will LOVE it! Because this recipe has the soul. Try it out! The recipe is down below! Place 400g of turkey into big sauce tray. Add 2 tbsp. of sesame oil, 1 tbsp. of light soy sauce. Coat the turkey breast in it. Leave to marinate for 20-30 min. Slice and dice 1 organic onion. Prepare the ingredients and the cookware. Toss the onions into the pan. Cook until crispy golden brown texture. Add ½ cup of rice, 1 tsp. of coconut oil. Pepper it and stir well. Slow cook for a few minutes, do not forget to stir. Cut handful of cherry tomatoes in half and toss it into the pan. Stir well. Grate 100g of parmesan, toss it into the pan, and stir well! Let the cheese melt. Preheat the toaster, grease with oil. Load the meat in the toaster. Grill for 2.5 min plus 2.5 min each time until the doneness you want. When almost ready, cover the steak with 1 tbsp. of Almazan steak sauce. Serve the steak with risotto as garnish. Finish off the dish with chopped fresh celeriac. 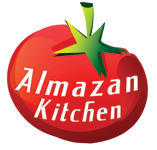 What is almazan steak sauce and is there a recioe for it? Please and thank you.